Lynden Johnson, St. Valentine’s Day Regatta Committee Member and Gabriella Suighi, CBC Marketing Manager – Activations. The Caribbean Bottling Company (CBC) will be sharing a bit of Coca-Cola love at the upcoming St. Valentine’s Day Regatta. The annual sailing event will be held on Feb. 16-17, at the Fort Montague Regatta site, and spectators will be able to take in the races while enjoying refreshing Coca-Cola beverages. 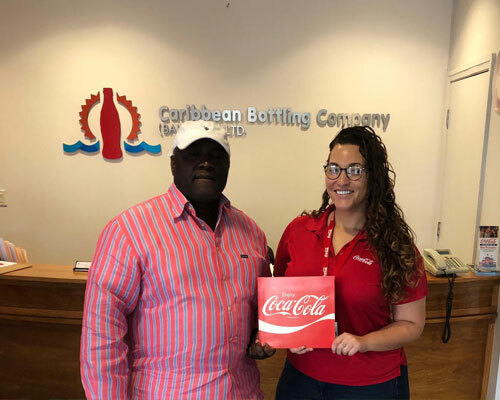 CBC provided monetary and product support for the event, and the Regatta’s committee expressed their gratitude for Caribbean Bottling’s continued support. They also noted that it is the committee’s goal to keep the regatta culture alive and strong in New Providence and throughout the Bahamas. The Caribbean Bottling team will be on site during the two-day competition, with refreshing Coca-Cola No Sugar samples.